I fell for it so hard that on any given day if I don’t have other perfume wearing plans it ends up on my skin. Not just a bit of love for this one, but a big burning love. That's Bois de Jasmin, The Candy Perfume Boy and Perfume Posse, respectively, talking about Shanghai Lily, one of the four fragrances in the Atelier d'Orient collection from Tom Ford (the other three are Plum Japonais, Fleur de Chine and Rive d’Ambre). They're all in the Private Blend range, and as I've written before about my general lack of affinity for Tom Ford Private Blend, I won't belabor the point other than to say that the two quartets released just before Atelier d'Orient, Private Blend White Musk and Private Blend Jardin Noir, did nothing to shake my suspicion that the whole line is overrated and overpriced. Still, when Atelier d'Orient came out last year, I dutifully smelled them all on paper blotters at Neiman Marcus. I did like Shanghai Lily the best of the four, but I didn't like it well enough to chase after a sample, so I went on about my merry way and forgot all about it. Then, of course, I started seeing glowing reviews here and there, and wondered if I'd been too hasty. But I didn't wonder all that hard — I'm prone to inertia anyway, and hey, it's not like there's a shortage of perfumes to smell these days, right? Soon enough I forgot all about it again. Then it came up a few times in the comments here recently, again with glowing recommendations, and I figured it was time to give it another shot. 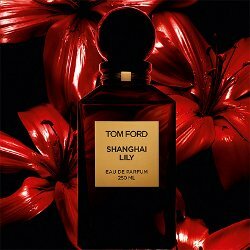 Shanghai Lily is a floriental; Tom Ford's people tell us that it "transports the senses into a world of rare and opulent ingredients from the historic silk road", and, extra bonus, brings on a "hazy reverie of glamour and temptation" — almost sounds worth the $250 for the small size, right? And it is lovely, particularly in the opening, which is a perfect-for-winter blend of juicy citrus and warm spices with a substantial dose of clove (other notes: bitter orange, black and pink pepper, jasmine, rose, vetiver, tuberose, cashmeran, guaic wood, castoreum, amber, benzoin, vanilla and frankincense). The first twenty minutes or so live up to the hazy-reverie billing, as it warms on skin and the floral notes come into focus, first rose and jasmine, then something closer to lily, but a quiet sort of lily, nothing like so sheer as Cartier Baiser Volé, but nothing so single-minded as Serge Lutens Un Lys either. The florals are draped over a creamy wood base, just sweet and vanillic enough, but not so much that it becomes cloying. Too soon, though, the reverie fades, along with the historic silk road and all the rest, and I'm back in a bitterly cold January. Shanghai Lily has reasonable sillage and the lasting power is more than adequate, mind you, but the later stages feel a bit flat. The clove lingers far into the dry down, but the florals fade far too quickly; what's left is basically a rather mild spiced wood that makes me think I'd be happier in Donna Karan Black Cashmere. If I could find my Donna Karan Gold, I might try layering it with Black Cashmere to see if that would produce a lily with more oomph. Verdict: Shanghai Lily is well done, and I will readily admit that I'd like it far better if it cost far less. It's considerably more compelling on skin than on paper, and that isn't always the way it works out. But it isn't compelling enough after the first hour to make my buy list. I won't go quite so far as Persolaise's "unremarkable, if totally competent" (ah, see, I'm not the only one who doesn't adore it!) but still, I'm not enthralled. Tom Ford Shanghai Lily in available in 50 ($210) or 250 ($520) ml Eau de Parfum. For another take on not loving a perfume everyone else thinks is perfect, see Angie's review of Amouage Fate Woman, and of course, do comment on any perfumes that everyone else loves but you! I remember taking note of this early on when Octavian wrote about it on his now-defunct 1000 Fragrances blog (I’m still in mourning over that). I have sample but have not spent much time with it, mainly because I’ve realized I don’t really care for lily perfumes – too cold for me. I may revisit it this summer. I love lily in general. This one, I think, would be too heavy on the clove for me to wear in summer? Octavian wrote about it before it came out and said something VERY special was coming. Of course, I believe he appreciates a new technical achievement as much as how good something smells. Although I am one that tends to avoid any lilies in perfumes, I find this well done and highly wearable. Perhaps it’s because it is not too Lily-centric compared to other Lily fragrances. Personally though, I would choose Fleur de Chine (I already own this one) or Plum Japonaise (my next target). It’s on my to buy list–it’s the first lily scent I’ve liked and that didn’t go nuclear on me but there’s dozens of scents on that list and there are a few scents that are higher priority–Shanghai, Opardu, Byredo Green, Jardins d’Armide, etc. I am obviously going to be outnumbered here, but that’s to be expected — I know many people loved it. I have a sample of this somewhere, will have to dig it out and give it a go. I haven’t been terribly enthralled with TF either, though I enjoy NdN and Cafe Rose enough for decants of each. But I agree that they don’t typically seem to merit the exclusive price tag they boast. The only one so far that I’d really like to own is Oud Wood, although I’d take decants of several I’m sure — Santal Blush is the first that comes to mind. LOL! At least it was less screechy. I’m with you on Santal Blush. Based on Octavian’s glowing review of it I went in on a split unsniffed (my bad!) To me it is plasticky. Am I the only one that doesn’t like this fragrance? The first few minutes of wearing it was tolerable. However, after a while it gave me a headache and felt as if I could not get the scent off of me. Nice whiff but terrible smell. A scrubber, no less! I’m sure you’re not alone. I eagerly tried it when it came out: I absolutely love the name and the red color for the bottle, I read the rave reviews and I am a fan of lily-based perfumes (Guerlain’s Lys soleya, le labo Lys 41 and SL’s Un Lys, DK gold). However my nose declared Shangai lily unbearably cheap: it smelled of plastic with a sickening rotten/sweet nuance. I suppose I should be glad for the money saved… But the name and the red bottle told such a beautiful story, I was a bit sorry to let it go. Red bottles… There are not enough out there!!! Red+lily was a brilliant idea, IMO. Is the bottle actually red? I don’t remember. Agree there are not enough out there! I like it; I like it quite a bit. This would be my lily if I felt like I needed a lily in my collection. But I don’t like it near enough to pay the asking price, which makes me wonder at what price I’d bite. And another thing…. as much as I like it, it isn’t something I’d want to wear often. This is more like something I’d want as a candle, I think. Hey, you know, you’re right — it would make a great candle. For quite some time I’ve been waiting for the fragrance version of the Rubrum Lily candle by Frederic Malle. When Shanghai Lily came out, I thought it was exactly that! Am intrigued by the idea of layering Gold and Black Cashmere… I could do that experiment, though of course couldn’t compare it to SL. Oh, do let me know if you try the layering! Gold is a funny scent, not sure how they would go together. I don’t think they’d be much like SL at all, but thinking they might be better. Or a hot mess. I tried layering Gold and Diptyque L’eau, but the Diptyque was vanished after ten minutes, leaving me with Gold alone for the rest of the day. Big failure. Interesting! At least it wasn’t a horrid mix. Heh. I just went and bought a mini of Black Violet off ebay for $12. Shipped. That’s probably all the BV I’ll ever need anyway. This is my favorite lily so far. I blew threw a sample, got a larger decant, went threw that and am waiting for another. This lasts forever on my skin and I enjoy it all the way through. Wish the cost was 50% less (or more!). This could be my signature scent except I get bored after a while with most anything. It should be easily half what it is…and even $125 is steep IMHO. But I do think this is one of those brands that gains its prestige at least partially via the luxury pricing. I’ve only smelled Shanghai Lily on paper, and I liked it well enough, but I liked Plum Japonais better. But I haven’t tried either on skin so that could change things, I guess. I don’t really go out of my way for these since they’re so expensive. None of the other 3 really hooked me, on paper anyway. I suppose I should try them all on skin, sigh. I was just at one of the Costco stores in Silicon Valley, where we have a very large Asian population — many of the end of aisle displays are brilliant red and gold gift packages of chocolates, candies, cookies that are all done up specially for the upcoming Chinese New Year, which involves gift exchanges that rival the traditional American Holiday gift giving. Since this is such a happy tradition, the greater population here is more and more celebrating with food, gifts, and general good will. I am guessing from the packaging and Asian New Year themes this may be targeted to affluent boyfriends/husbands gifting their wives /girlfriends for the New Year. I can imagine the process — young techie guy runs a computer search for popular, precious perfumes on the computer, exchanges a few hints with his girlfriend’s friends, who mention ‘Tom Ford’ among other popular designers, then swings by Stanford or Valley Fair shopping centers to make a quick pick from the fragrance department …. the prestige price, the beautiful point of purchase advertisements, the glorious packaging — a slam dunk sale for the new year! I am sure that one of the reason ‘prestige’ perfume is so pricey is because sometimes the giver has to be seen as willing to spend a lot of money on a gift. Price in some situations, is more important than the scent itself. Same with gifts of wine and spirits. Sellers spend a lot of money on market positioning, and they need a mark up on the product to pay for that. I know I would be delighted to receive prestige gifts, I would indeed send back a thoughtful thank you note. However, I am less likely to spend a lot of money on fragrance that I am buying for my own enjoyment — its more the quality of the experience of smelling it that would entice me to spend more. I do think for some brands, that’s absolutely so…the more you charge, the more people will assume it’s a worthy item. Great analysis, Poppie! I think you’re probably right. I have a sample of SL and it’s lovely, but I prefer my $10 ebay bottle of Gold edp. Since I have the sample, I’ll try layering Gold & Black Cashmere and see how it is, comparatively speaking. As to perfumes that others love but I don’t, well, that’s a long list. Sometimes I get an Emporer’s New Clothes feeling, like tons of praise is occasionally heaped on a scent that I (subjectively of course) just don’t think is that good. Not that I doubt myself or others, like I said it’s all subjective. Gold was a great scent, shame it didn’t sell. It’s only been a few minutes but SL is a bit sweeter and spicier, G + BK is a little bit drier and woodier. I tried Lys Soleia but that made it more floral. I find SL the nicest, but admittedly there’s not toooo much difference. Oh, you’re a doll! So the BK didn’t eat up the G?? It really still smelled like lily? The BK was much more obvious than G, so it would have to be at least a 1:2 ratio, but I suspect you’d have G dripping off your arm before it ever got to the SL sweetness. That said, after a couple hours (hot day doing housework) they did kinda smell the same. Haven’t tried this one yet, guess I should. Hmm, scents everyone loves but I don’t..hmm..well, POAL by Malle comes to mind, I didn’t think much of it. I know there are others but can’t think of them atm. Never hurts to try! As you can see, lots of people love it. I’m with you on this one, Robin. I liked it well enough for the first few hours, but as the day wore on, the drydown really started to grate on my nerves. In the end, it didn’t work for me. My favorite lily fragrances are of course, Baiser Vole , and Guerlain’s Lys Soleia. Oh, and there are many fragrances that everyone else loves but me! Shalimar for one! Yay, that’s one for my team! Me too on the Shalimar! I can go in the reverse… I LOVE Gucci Guilty, Men and Women, but everyone here seems ready to excommunicate me for loving it because I don’t think there was one positive comment about either of those scents! But I Love them both still… without reserve! We have never yet excommunicated anybody for their fragrance preferences…even when they’re the only one who likes something, which I’m sure you’re not. As for the fragrance that gets Inordinate amounts of Perfume love that I have just NEVER understood why… Fendi Theorema. Just does not one thing for me. Not a fan but again that thing gets love HEAPED on it! The rest of the world must agree with you or it would still be in production! That is very much so, although in my defense will say it was not so rare when I bought it (it was discontinued but still available for sale in my local mall) and I adored it at first sniff. I truly believe that Tom Ford and his fragrances are like an acquired taste; you either love them or you don’t. I bought my 1st bottle of a Tom F fragrance at the beginning of this year. I bought Santal Blush and absolutely love it. I get sooo many compliments when I wear it. Not sure how I feel about this one, but I have a new appreciation for the talented Mr. Ford. I’ve lost track of the TF Private Blends and after a badly judged (unsniffed) purchase of a decant of Santal Blush I’ve lost interest too. Plus I am still sulking about the discontinuation of Velvet Gardenia. Oh hang on, to be fair, after sniffing (see I learned my lesson) I got a decant of Tobacco Oud and like that. I always enjoy reading your reviews, Robin, even if I know I will never buy/wear/sample the perfume. Way back in the day, I *did* sample some TFs, but thought they were very over-priced for what I was smelling (he’s the wood box w/key guy, right?) so it’s one more house I’ve crossed off of my “to try” list. P. S. But I *do* have a weakness for jewel-colored bottles! I guess I should give this one space on my skin alone for some time to get a proper reading. I always try several TFs at once, and this one just never makes an impression on me. My favorites from the range – though I don’t own any – are Cypress Woods, Tuscan Leather and Noir de Noir.